“The Internet of Things, smartness, connectivity and Industry 4.0 are terms that have become buzz-words. Even though we expect gains in productivity and efficiency through these new concepts, history shows us that transformative change is simultaneously disruptive and progressive” said Russell Patten, EVIA Secretary-General. 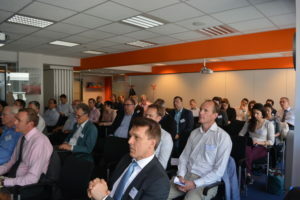 On 15 May, EVIA organised a workshop alongside its Annual General Meeting, aimed at fostering a debate between industry partners, standardisation experts and EU policy-makers on the connectivity issues specific to the ventilation sector. This workshop enabled over thirty five participants to better understand how to actually realise the benefits of digitalisation and also how to amplify the sector’s voice on broader digital issues including cybersecurity, and data protection and access. During the first session the Chair of EVIA’s Connectivity Working Group, Jurgen Albig (Ziehl-Abegg) mapped the benefits, including improvements in Indoor Environment Quality (IEQ) and challenges, related to data protection and cybersecurity, that accompany the proliferation of smartness in the building appliance industry. Vivian Dorizas from the Buildings Performance Institute Europe (BPIE) then defined a smart building as covering the entire building eco-system and its abilities to contribute to energy efficiency, warmth, health aspects and consumer empowerment. Subsequently, Sylvain Robert a policy officer at the European Commission’s Directorate-General Energy, provided an update on the state of play of its policy efforts on connectivity in buildings including developments on smart appliances, the Smart Readiness Indicator (SRI) and Building Automation and Control Systems (BACS), which are all expected before the end of 2018. From the industry’s perspective, Simone Alessandri from eu.bac stated that BACS are essential to realising the full benefits of connectivity in linking different technical building systems together to optimise the overall performance of a building. Further, Mr. Alessandri urged for a balanced approach focusing on the deployment of BACS in residential and non-residential buildings. In the third and final session Enrico Scarrone Vice-Chair of the oneM2M international standardisation initiative stated that fragmentation in operating interfaces via closed IT ecosystems is the enemy. Interoperability, facilitating an open and competitive marketplace, in addition to open access for operators throughout the value chain to product level data and the meaning of data are essential to exploiting the value of the Internet of Things. EVIA as the European industry association for the sector is working hard to ensure that the regulatory environment for connectivity in the built environment is structured to fully release ventilation’s smart potential. Via the creation of a dedicated Connectivity Working Group EVIA intends to engage on sector specific legislative opportunities, including the Smart Readiness Indicator and BACS, whilst also plugging members into the wider digital policy debates surrounding cybersecurity and data protection.